On March 28, 2018, David Pomianowski of Local Union 1274 (Bridgeport, Connecticut) celebrated his 50 years of membership in the International Union of Painters and Allied Trades. During LU 1274’s monthly meeting, LU 1274 Business Representative Jason Werthman and LU 1274 President Richard Shaw presented a plaque and watch to Brother Pomianowski commemorating his membership to the IUPAT. 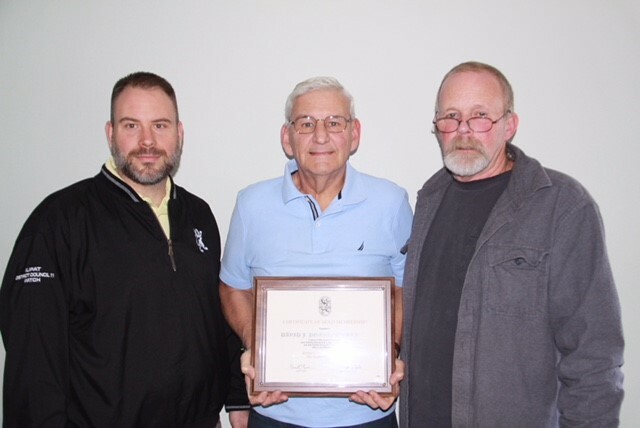 L-R LU 1274 Life Member David Pomianowski (center) was presented with a plaque commemorating his 50 years of membership by LU 1274 Business Manager Jason Werthman (left) (Business Manager, LU 1247) David Pomianowski (Life Member, LU 1247) and LU 1274 President Richard Shaw (right) (President, LU 1247) in March.